Eleanor Roosevelt had six children with her husband Franklin. The couple’s first child, Anna, was born in 1906. Five sons followed during the next ten years: James (1907), Franklin, Jr. (1909, died in infancy), Elliott (1910), Franklin, Jr. (1914), and John (1916). This well-worn gold locket and chain is etched with “E. F. 1903” on one side. This likely commemorates the year of Eleanor and Franklin’s engagement. The helm, torse, and crest from the Roosevelt family coat of arms are etched on the other side. According to the donor of the locket, Roosevelt granddaughter Anna Eleanor Seagraves, the indentation marks on it were made by Eleanor’s children when they were teething infants. The hairs protruding from the locket are thought to be from Elliott Roosevelt or the first Franklin, Jr. who died in infancy. 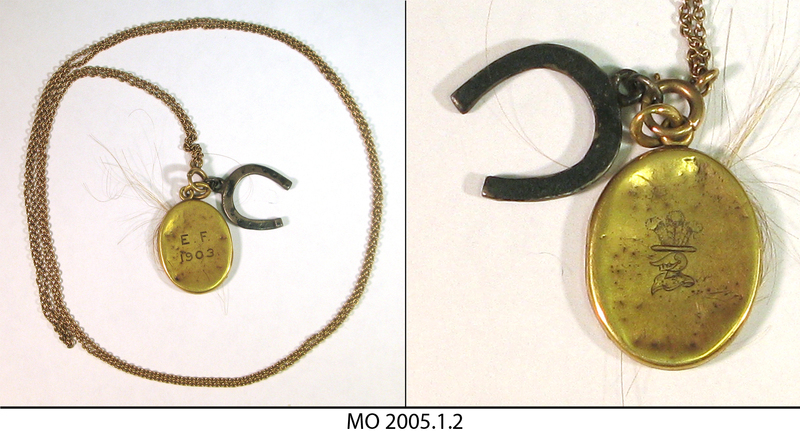 Inside the locket are two tiny unidentified photographs. It is believed that the horseshoe charm was added to the chain by Eleanor or her daughter, Anna, who received the locket from her mother. Anna later gave the locket to her own daughter, Anna Eleanor Seagraves.